Loose mineral foundation in quad chamber packaging to create a perfect mix. Blends seamlessly into the skin providing an SPF protection of 15. Mineral based with no parabens, preservatives, or dyes. Infused with Vitamin E to hydrate & replenish skin. Dial allows you to control the amount of product. Each pot containes .28 oz of product. All info taken from the Elf website here. I picked up the shade Light which has the four colors Porcelain, Fair, Light, & Beige in a little pot with 4 different chambers. First off the packaging is horrible - but luckily it's easily modified. In an ideal world, you would use a little bit of each shade to make your perfect blend. While that's totally do able, it takes way too long. Under the lid are two types of sifters. The first one on the top is a dial with a scalloped shaped opening. This you can turn between each opening of the bottom sifter to shake out just a bit of each color. That does not work. What I did was pop off that first sifter so I was just left with the 4 openings of each quadrant. Luckily, all four shades together works pretty well for me. One of the quadrants is a bit too dark & too yellow for me but the others blend it out. So a down side would be that if your were rather fair the Light shade would probably be too dark for you. If you were able to pop of the top sifter then block off a few of the sifters, you'll probably get the greatest shade for you. First impression on application was amazing. I was oil free for the longest time - pretty much a 6-8 hours (my whole work day) and my make up looked good even after leaving work. I used this for the first time over my CoverGirl 3-in1 Stay Fabulous Foundation, which is a pretty full coverage foundation to begin with but the addition of the mineral foundation brought it up a notch. I've also liked this over the Almay Blemish Heal Foundation, & I believe over my Lorac POREfection Foundation. The coverage is great by itself & it does really step up the coverage of a liquid foundation. 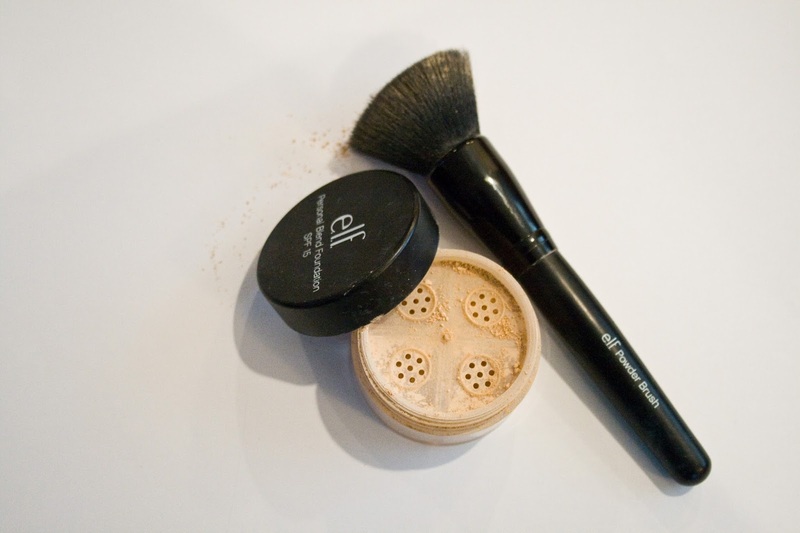 It is finely milled & can blend in like you would expect any mineral foundation to do. When I am testing out a foundation the key for me is that it wears all day. I need it to look great from morning to evening. I put my face on at 6am, get off work a 4pm, and do stuff after work - like film - and I don't like to redo my make up. With this over foundations such as the 3-in-1 by CoverGirl, the Almay Blemish Heal, and the Lorac POREfessional I've noticed I stay oil free for longer. My regular setting powders have never gotten me past lunch before. I usually start to notice a break down as soon as I go to the bathroom around like 9am or 10am but with this as a setting powder I find that I'm pretty oil free all day. When I touch my skin it feels dry...if you have oily skin I think you'll know what I'm talking about when you start to get scared you're gonna swirl your make up around on your face at some point during the day. I also don't notice the mars around my glasses on my nose through the day. This powder really makes your foundation stick. As a foundation itself it also performs well. I think I'm done with the BB Cream thing because with that I have to set & it's a liquid - this is one step with awesome coverage. This gives me so. much. coverage! Over the Easter weekend, I really didn't want to deal with my doing a crazy full face - I don't want to look like it's prom in photos where everyone looks natural.....you know? I just wanted to even my skin tone & cover some blemishes. 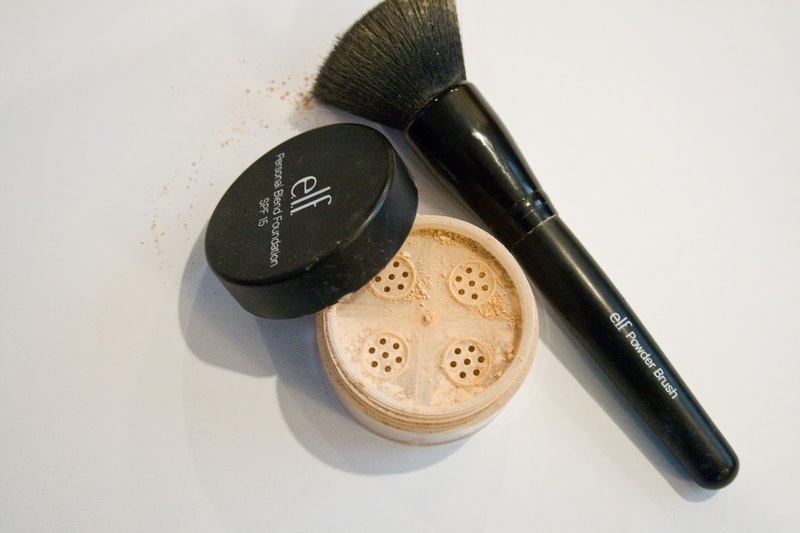 Buffing this in with the Elf Powder Brush (pictured above) really gave me full coverage but it was so light! The wear time of this by itself is pretty great too. I'd say a full 6-8 hours (+ even). It covers redness & stays all day. I found that I didn't get as oily either. With this, since it's not liquid, you're not getting any weird separation or pooling on your face. Overall, if you can get passed the horrible packaging & you (again.....) fall in the light, medium, & deep categories.......this powder is really good. For me the pros out weight the cons & the biggest thing is the coverage and staying power by itself. I would say that if you're looking to try out a mineral powder foundation this would be a great start. 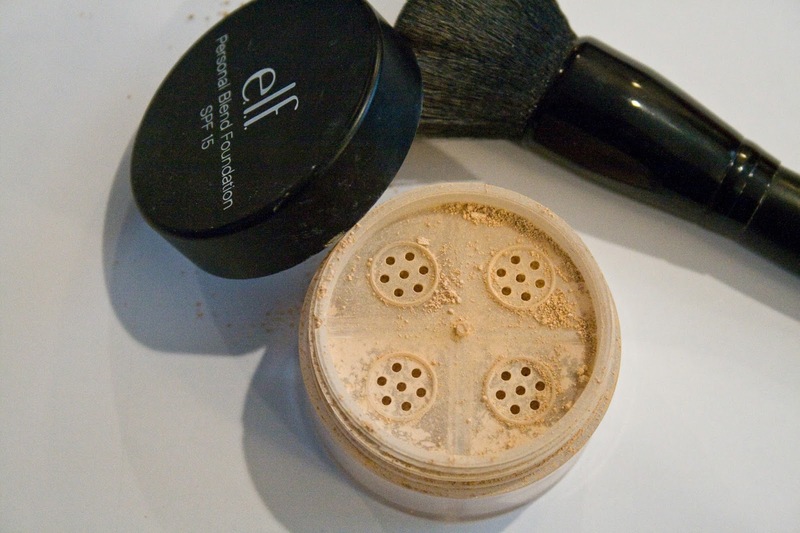 Elf has a Mineral Foundation in different shades - more than the light, medium, dark - here. The Personal Blend Foundation is $8 & the other Mineral Foundation is $5 (but catch it on a 50% off sale!). But if it's something you're interested in trying, this is a really affordable option. I am always being impressed by Eyes Lips Face and love trying things out from the brand because it's so affordable! I know I do a lot of reviews of Elf on here but honestly it's because I'm so impressed all the time.